You are probably not doing it wrong. 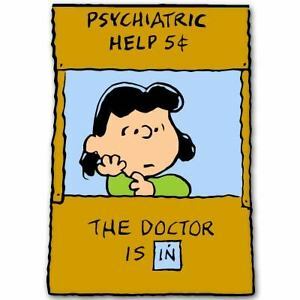 I’ve been feeling a little like Lucy lately, the ornery character in the Peanuts cartoon strip. Not the ornery part (although those close to me might defer), but the times she sets up her free advice booth. I’ve had a lot of people come through my studio lately, who, obviously finding my artwork appealing, share some of their wistfulness about their own art careers. I love giving advice. Having said that, I should, in the spirit of honesty and truthfulness, I’ve given a lot of bad advice. I’ve learned I really don’t always know what’s best for others. And every time I think I do, it goes very badly, for me and for them. But sometimes, the misconceptions, the myths, the fears, and the self-doubt, are so obvious, I can’t help but point them out. It’s not silly to want a studio. You need a place, a space, or a pocket of time to do your artwork. You wouldn’t begrudge yourself a bed (nor sleeping). Why would you think having a dedicated table, or a small room, or even a garage/barn/studio to create, is selfish? It’s not wrong to want to sell your art. It’s okay not to give away all your secrets, about how you do what you do. It’s okay that, as a a wife/mother/parental caretaker/everything else society offloads onto women, you feel like a horrible person for even thinking of making art. It’s okay to feel overwhelmed about the business side of your art. Believe me, I’ve been there. I still go there. And I’ll probably be there for the movie version, too. In short, you’re probably not doing it wrong. But there may be a way to do it a wee bit better. Your homework for today the rest of the year: Read the articles in the links. If you still have questions, I’m here. Author Luann UdellPosted on October 30, 2015 October 30, 2015 Categories advice on getting adviceTags get a room with a view, it is okay to hate selling your art, many ways to be an artist, there is no wrong way to be an artist2 Comments on ARTIST S.O.S.